Almost untouched in the C19, the nave and western chancel are C12. The latter was lengthened in the C14, which is the date of most windows. The west end and tower are C15. Hamsey church stands on a low mound near the river Ouse with only a farm nearby, though as late as 1780 the ruins of a manor house were to be seen (VCH 7 p83). Archaeological investigations have not substantiated the earlier conclusion that the mediaeval settlement was here or that it probably dispersed for lack of space above the flood line (2 p67). It now seems more likely that the settlement, though large in area, was always scattered (MA 28 (1984) p242). A church is mentioned in Domesday Book (12,49), though the oldest parts today, most walls of the aisleless nave and the western chancel, are probably C12. It has been suggested that they are earlier, but the breadth of the simple round-headed chancel arch in proportion to its height argues against this. 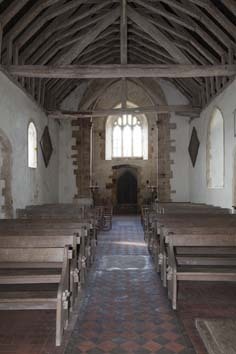 Windows in the south west nave, in the north west chancel and the north doorway of the nave, plain with a segmental head, are compatible with such a dating, though the last may have been altered. There was probably then no tower. It is likely that an early C13 north chapel was added to the nave, but nothing of it is known, except for a surviving blocked, pointed arch. It has a deeply cut keeled roll-moulding and an inverted capital on the east respond, which is cut away below. The big trefoiled south east lancet of the nave and a smaller north west one are later C13, like the two-light south window of the chancel which has a lozenge-shaped opening in the head. 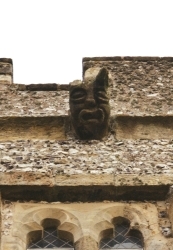 The south lancet may be related to the big recess south of the chancel arch, though this has a rounded head, which looks earlier. It was probably for a nave altar and the big pointed one north of the chancel arch marks another. 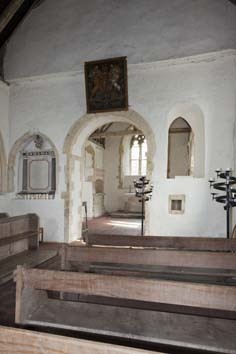 On the basis of these recesses, Meads questions the existence of the presumed north chapel, but it is difficult to see what other purpose the arch could have had. The late C13 chancel window predates the C14 lengthening of the chancel. Though the evidence is mostly concealed beneath the render, the new work has a low plinth to the south. The lightly restored three-light east window is the best preserved of those associated with Ardingly (West Sussex) with a head of an elongated quatrefoil and two mouchettes. Only part of the rere-arch of a north window of this period, which was replaced in the C16 by a doorway, remains. 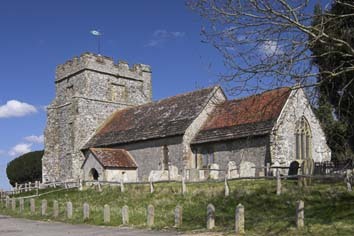 In the C15 the nave was extended by about 6ft to the west (the original quoins are clear) and a strikingly squat tower with big diagonal buttresses, containing unexplained squint-like holes, was added. The west window has panelled tracery above a doorway of two hollow-chamfered orders. Without giving a reason the VCH suggests the battlements and tiled cap are C16 (7 p86). The proportions might be accounted for if there had been an intention to build higher, but against this is that the double bell-openings are situated in the conventional position and there is a gargoyle where it would normally be expected beneath the battlements. Both suggest that the tower was finished according to its builders’ intentions. The tower arch with semi-octagonal responds and a double hollow-chamfered head is as high as the interior. The crownpost roofs throughout could be C14 or have been replaced at this period. The seemingly identical one over the western part of the nave at least must obviously be C15. Definite C16 changes include a new four-centred south doorway and possibly the porch, with a chamfered arch and square side-openings. 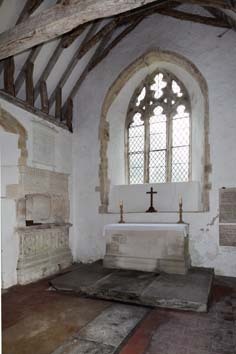 The chancel was adapted to house the tomb of Edward Markwick (see below), described in his will of 1534 (SRS 42 p254). This work included the four-centred north doorway, now blocked. It was probably for the use of the priests charged with saying mass under Markwick’s will. Assuming there was a north chapel, it was probably removed in the C17, which is the likely date of the round-headed window in the blocked arch; if so, the plain square recess visible inside cannot be a piscina or an aumbry. Most bell-openings were blocked, though in the Sharpe Collection drawing (1797-1805) the north one is apparently open. Nibbs (1851) shows the church much as today apart from some creeper on the tower. 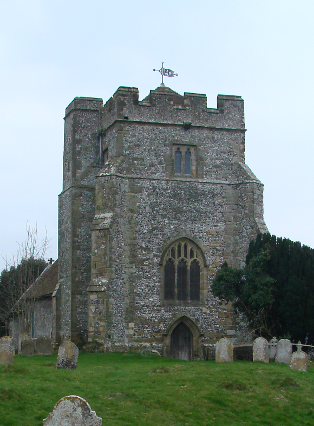 There was no C19 restoration because a new church was opened in 1860 at Offham, effectively the centre of the parish. 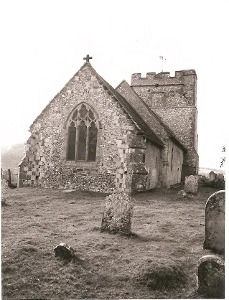 Hamsey church became a mortuary chapel as the graveyard continued in use, but was otherwise little used, though repairs in c1873 included the removal of plaster (but not much, it would seem) and new seats (5 p227). It was put into order again in 1928 (1 p52), but the old plaster and the mellow, crumbling, render outside were preserved. The identity of the architect was not stated, though as W H Godfrey himself was the author of a note about the church published at the end of that year (see 4), he must be a prime candidate. Benches: (Nave) Some narrow ones, probably C16. Door: The south door is C16 made of long planks. Font: C15 octagonal with trefoiled panelling on the sides and stem. Glass: (South east nave window) C14 fragments. 1. (North chancel) Edward Markwick (d1538) – see above. It is handsome, though without an effigy. Above the chest, which has three cusped quatrefoils bearing shields, is a flattened arch beneath a band of quatrefoils and creating. It resembles other monuments of the period, e g one at Kingston Buci, West Sussex. 2. (North chancel) Henry Shiffner (d1795) Generally plain and set on a panel shaped like a trapezium. Signed by Parsons of Lewes, who at this date can only be L Parsons. 3. (North nave) Sir John Hutton Cooper (d1828) Plain tablet, signed by —- Storey of London. 1. (South nave) Plain pointed C13 connected with the adjacent nave altar. 2. (South chancel) Early C14 with a trefoil head. 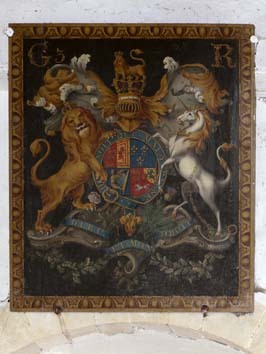 Royal arms: (Over chancel arch) George III – painted on panel. Squint: (Under the opening south of the chancel arch) Though called an aumbry by the VCH, this is open through the wall and is broader to the east, where it is divided by a shaft, so it is more likely to be a squint. Stoup: (South porch) Chiselled off flat and uncovered in 1928. It is probably C16.